From disappearing fabric pens to dress forms, Dritz produces a huge range of notions for the home and professional seamstress. Most items are very affordable and widely available at local craft stores or online. This company is famous for having a tool for every sewing and quilting task. The company John Dritz & Sons began in the 1920s as a manufacturer of stylish beaded handbags for women during the flapper era. In the course of their business they developed a variety of useful tools, such as the seam ripper, which went on to become sewing essentials. Eventually, as handbag styles changed, the sewing notions became the primary focus for the business and in the 1960s the family sold its operation to Scovill of Connecticut. Today, Dritz is owned by Prym. Jo-Anns is one of the official retailers for Dritz. As such, you'll find everything you could possibly want there. Nancy's Notions offers hem gauges and ironing products among their Dritz lineup. Amazon.com is a great place to find almost all the Dritz products on the market. There are thousands of options available, from Fray Check to seam rippers. 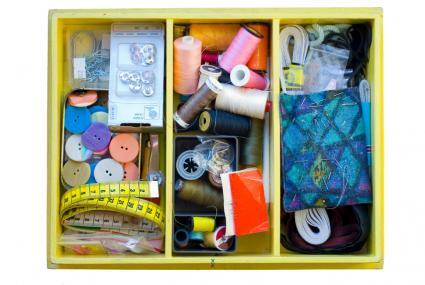 Create For Less also offers more than a thousand Dritz sewing tools including grommets, boning, closures, and more. If you're overwhelmed by the huge selection of Dritz supplies available, it may help to make a list of items you need. Don't forget to include some of the most popular Dritz sewing products listed below. Since most Dritz products cost only a few dollars, they are affordable items to outfit your sewing kit. Watch for sales at your fabric store and online, and compare prices between different shopping resources. Although all the products are useful for certain applications, consider your own needs. If you only buy what you will use and get a good deal on your purchases, your sewing basket will soon be fully stocked with Dritz sewing supplies. For more information on the full range of Dritz products, visit their website.